A core value of the Centre for Social Data Analytics (CSDA) is to share knowledge on the use of linked administrative data for positive social impact. CSDA Co-Director, Rhema Vaithianathan is actively involved in educational events worldwide on the potential of linked data. 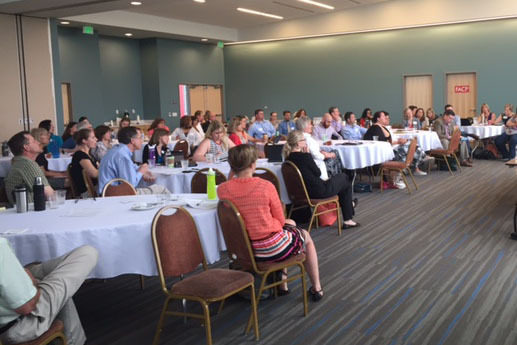 In June 2016, Vaithianathan traveled to Centennial, Colorado to present at a predictive analytics event hosted by Casey Family Programs and the Colorado Human Services Directors Association. In July, Vaithianathan visited Nesta (a charitable organisation supporting innovation worldwide) in London and led a round-table discussion on the use of predictive analytics in child services. At these events, Vaithianathan spoke about the use of predictive analytics in child welfare, including the development of a reactive predictive risk model for child welfare referrals in Allegheny County, Pennsylvania. Her visit to the United States coincided with the upcoming launch of this tool, which will assist call takers to screen thousands of calls alleging maltreatment every year. “People can see how the data that they collect regularly can be used to make better decisions by front-line services”, Vaithianathan said of the reception she encountered at these events.